OS91 just received a phone call from the dad of a young man in the Military who has been deployed to Afghanistan for the past several months. Before he left, we gave him Psalm 91 cards for himself and his team. Not one of his team was wounded during their deployment and he is on his way home and will be on U.S. soil soon! Our God is faithful! Praise the Lord! When I was a little girl, my granddad had a storm cellar. The best one in the little town where we lived, it was a very popular place. Even though (as far as I can recall) we never got hit by any life-threatening storms, my kinfolk never took any chances. We all headed for Pop’s cellar at the first sign of troublesome weather. At the time, I thought it was all pretty exciting. I liked the idea of having a refuge from the storm. Normally, the word horrors, which is used in that translation, isn’t one I like very much. But I have to admit, it fits some of what we’re seeing right now. There’s been a startling increase in evil here in America in just the past 20 years or so. People are behaving in crazy, devilish ways. Parents are killing children; children are killing parents. Young people are committing mass murder. We don’t know what will happen next. Personally, I believe the Church will be raptured out of here before the worst comes. But even so, I don’t know how much this world is going to deteriorate before we’re gone. Things could really get bad. I’m not afraid, though, and you don’t have to be either, because God promised to protect us right in the middle of it all. He said He will be our refuge. God is a far greater refuge than my granddad’s storm cellar ever was! He’s with us wherever we go. If we’ll stay connected to Him, we can drive around in our car, fly on an airplane or walk down any street in any city in the world without ever leaving our shelter. God’s got us covered all the time! The Hebrew word translated dwelleth means “to lodge somewhere.” It refers to a place where you live, remain and stay. When you’re dwelling in God’s secret place and abiding in His shadow, you don’t come and go in your relationship with Him. You don’t live all week trying to see what you can get away with and then show up at church on Sunday. You’re in fellowship with the Lord and endeavoring to obey Him every day. You’re living in all the light you have and always seeking more light. I’m not saying you have to be perfect, of course. None of us is perfect. But as an abider, when you do stumble, you quickly repent and get things right again. How do you know when the Word is abiding in you? It talks to you! It directs your thoughts as you go about your day. It comes to your mind when challenges arise, and helps you know what to do. I’ve found in my own life that if I want the Word to abide in me I have to spend time in it. I can’t just read it casually every now and then. I can’t just listen to sermons and let them go in one ear and out the other. I have to be diligent to read the Word and meditate on it every day and obey it. I must treat it like a priceless treasure. That’s not hard for me to do because I love the Word of God. It’s precious to me. My deliverance, safety and well-being in life depend on it. The same is true for you. So stir up your love for the Word by not only reading it, but believing what it says. Make it the most important thing in your life! Renew your mind to the fact that when you’re abiding in the Word, you’re abiding in your supernatural, divine shelter. You’re living, protected from all harm, in the secret place of the Most High. There’s nothing better than dwelling in the secret place! It’s a bubble of protection where you’re surrounded with God Himself on every side. It’s a place where you’re concealed from your enemies and hidden from danger. If you want to see how secure this divine place of protection can be, read in the New Testament about how Jesus walked unharmed right through the middle of a mob of people who wanted to murder Him. They couldn’t touch Him because He was concealed in the secret place. Or read the Old Testament story about how Shadrach, Meshach and Abednego came out of the fiery furnace without a hair on their head being singed and without even the smell of smoke on their clothes. The fire couldn’t hurt them because they were in a supernatural bubble, completely encased by the power of God. Notice those verses say that the Lord encompasses us like a fortress with His protection. He encircles us with His power so that when our enemies try to surround us, they find we’ve already been surrounded. They can’t get to us because God already has us covered all the way around! God’s promises don’t just work for us automatically because they’re in the Bible. They have to be activated by faith-filled words. That’s why over the years, I’ve made God’s promises of protection a daily part of my prayer life. One morning a few years back, I was reminded in a big way just how vital such prayers can be. Not long after I finished praying, the ground under my feet began to shake. Ken and I were in a hotel in Hawaii at the time, on the 13th floor. We realized right away we were in an earthquake! At times like that, you really find out what’s in you, because before you can even think, it comes out of your mouth. I’m happy to report that what came out of our mouths at that moment was the Word of God. Unlike the lady in the room next to us who ran out into the hall repeating a curse word over and over, Ken and I instantly took authority over the situation in Jesus’ Name. We declared God’s promises of protection at the top of our lungs. Then, calm as could be, we did what the Lord prompted us to do. Although the hotel personnel had informed us the airport was closed and no flights would be going out, we felt led to go to the airport anyway. Sure enough, our flight departed as scheduled and, instead of being stuck in a hotel with no electricity and no restaurants (they all closed down) for the next few days, we went back to Texas, safe and sound, and enjoyed the comforts of home. One thing I particularly remember about that earthquake is this: Ken and I had absolutely no fear when it hit. We didn’t have to try not to be afraid. Fear just wasn’t there! That’s not to say we’re totally immune to fear. On occasion, it does try to rear its ugly head. But whenever it does, we throw a Holy Ghost fit. We run it out of our lives with the Word of God and refuse to entertain it for a second. Why are we so determined to stay free of fear? Because it’s impossible to trust in the Lord and be afraid at the same time; and trusting in the Lord is essential to keeping God’s protective covering intact. So anytime fear tries to come on you in any area of life, rebuke it. Resist it. Get scriptures that contradict what fear is saying to you and swing them at fear like a sword. Be violent about driving out all fear and seize the promises of protection God has given you. As Jesus said, “The violent take it by force” (Matthew 11:12)! No, there won’t if you take action on God’s Word. I don’t know how you would categorize that kind of situation, but I’d call it a bad day at Black Rock. It doesn’t get much worse than seeing 11,000 people killed on every side and being the lone survivor. Yet, the Bible says we can go through even that kind of devastation unafraid and unharmed, if we abide in the secret place of the Most High, say of the Lord, “He is my refuge,” and trust in Him. 1. The Hebrew word translated dwelleth means “to lodge somewhere.” It refers to a place where you live, remain and stay. Reprinted from the July 2013 issue of the Believer’s Voice of Victory magazine with permission from Kenneth Copeland Ministries. OS91 had the honor to participate in our first Yellow Ribbon Event today. 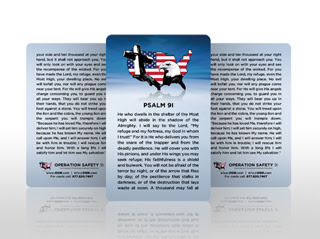 Although we have partners in various parts of the country who request our Psalm 91 cards as well as the Psalm 91 Military books to distribute at Yellow Ribbon Events, this was OS91's very first time and we hope now to be "regulars"! Yes! This is a SOLDIER! A Yellow Ribbon Event is an experience: hugging the necks of those Soldiers who are leaving their families and deploying overseas; embracing spouses, children, mothers, fathers, grandparents, and in laws of the brave men and women Soldiers who are leaving the U.S. and going to war zones and surrounding territories. The sacrifice of all involved is so inspiring! Our heartfelt thanks to Chaplain (LTC) Brian Ray, Command Chaplain of the 143rd ESC for opening the door to OS91 to reach our Soldiers and their families with the life saving message of Psalm 91.
and new "doors' to reach more Soldiers!